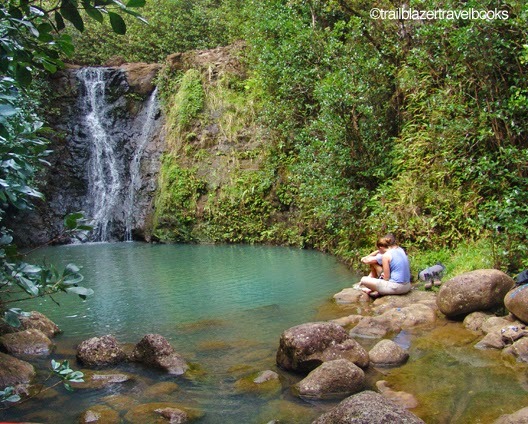 Surprisingly, populated Oahu has more wild hike-to falls hikes than any of the other Hawaiian Islands. This little beauty, Laie Falls on the northeast coast, is used mainly as an exercise jaunt by students of nearby BYU Hawaii. It makes a good add-on before or after a visit to the Polynesian Cultural Center. The round-trip hike is about 5.5 miles with an elevation gain of 1,400 feet—with an option to continue another 3 miles and 800 feet to the Ko'olau Ridge. You begin through a leafy birdland over eroded red-dirt roads, climbing to a view spot amid a stand of Norfolk Pines. The last traverse is a trail-tunnel through a thicket of strawberry guava trees. A rope aids the last hundred feet down to the stream, but it is not difficult. A second pool and falls lies just below those pictured here. See Oahu Trailblazer page 151 for the deets.